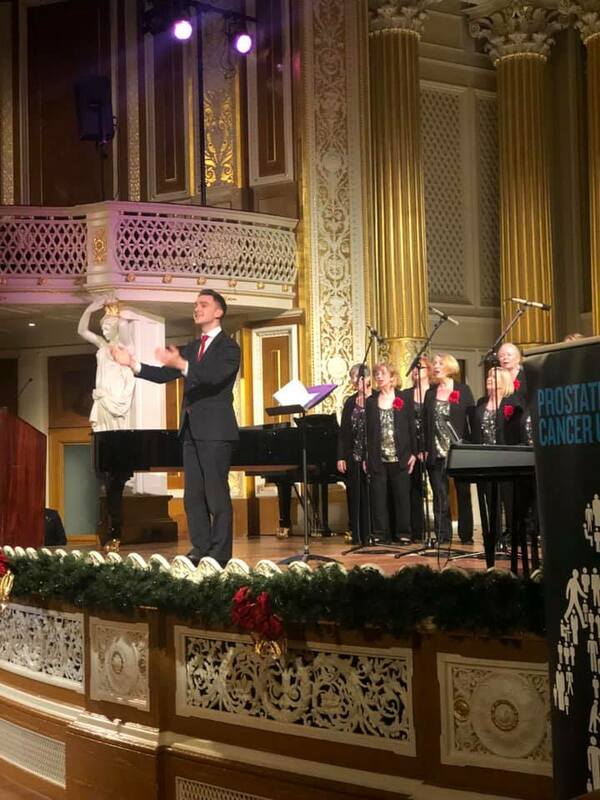 This national organisation held a Christmas concert at St George’s Hall, Liverpool on Monday, 3rd December. It was held in the magnificent Concert room and was very well organised indeed. 4 choirs took part: The Bunker Boys: a 40 strong group of golfers from Heswall, Wirral who sang a mix of Christmas music and a couple of regular songs. They were very well received and their act was followed by an extract from ‘A Christmas Carol’ read by Dean Sullivan. Next it was our turn and we sang ‘It came upon a Midnight Clear/Silent Night’; ‘Coventry Carol’; ‘Something’; ‘Cheer up Charlie’ and ‘Let it Snow’. We were delighted with the cheers from the audience who clearly loved our style of music. Our performance was followed by a reading of ‘Beatles Night Before Christmas’ read by Ray Clemence MBE and the last act of the night were the very entertaining LMA Choir who sang ‘A change is Gonna Come’ and ‘All I want for Christmas is You’. We hope the event raised much needed funds for this deserving charity.